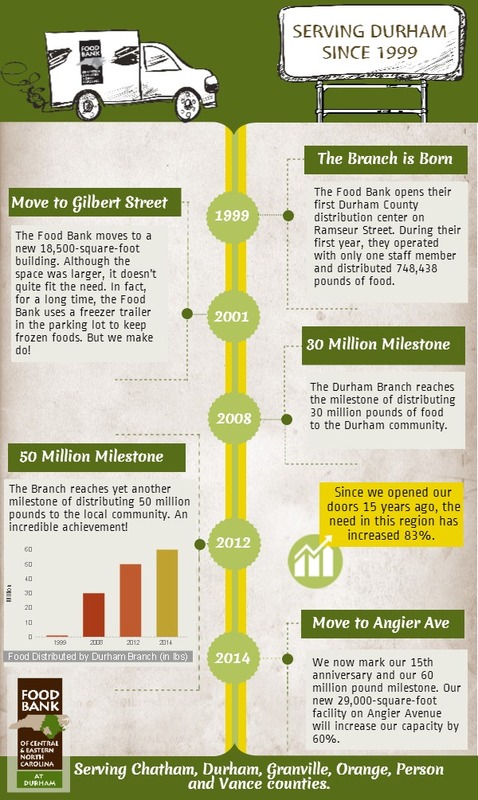 Since we opened our doors in 1999, the need in the Durham Branch service area has increased 83%. Today, more than 96,000 people, 30,000 of which are children, struggle with hunger every day. It is our mission to work hard to meet this ever-growing need to ensure that No One Goes Hungry in our 34 county service territory. And to achieve that in the Durham region, we needed to make some improvements. Our new location at 2700 Angier Avenue provides a much needed expansion in capacity and access. It will allow us to collect, sort and distribute more food to more families. To be exact, the new facility will increase our capacity to provide more food and better services by 60%. A larger facility also affords space for better equipment essential to safe, efficient food distribution. Cooler and freezer space has more than tripled from our previous facility, allowing us to store a greater supply of farm fresh produce and protein-rich meat. Increased capacity also means more space for larger and more frequent volunteer groups to bag produce and pasta, sort food drive, and pack weekend meals for children. The new location of the Durham facility opened yesterday with the official ribbon cutting ceremony. Food Bank staff, partner agencies, donors and other community members gathered to celebrate, tour the new facility, and cut the ribbon, of course. 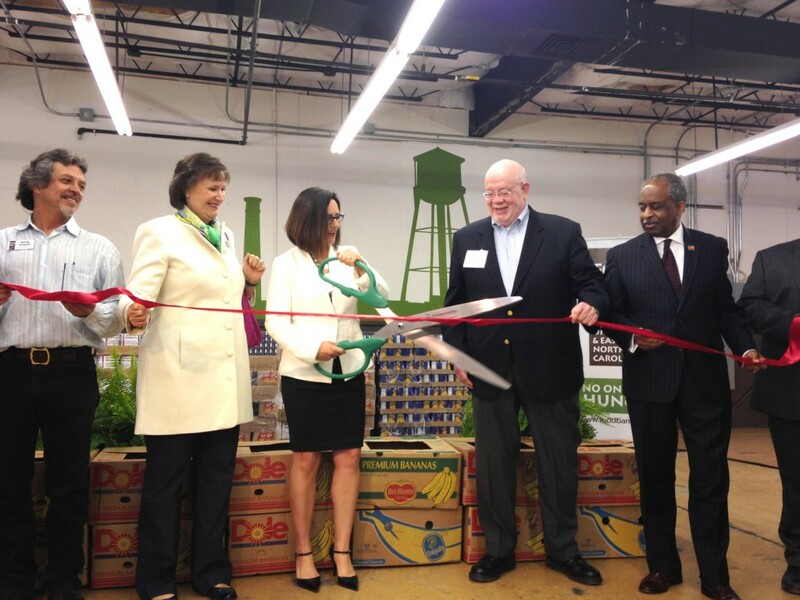 The program included remarks from Mayor Bill Bell on the impact of the Food Bank within the city of Durham. The Reverend Haywood Holderness, former Board Chair and community leader, gave a little history of the branch. A representative from Burton Elementary School, Kim Johnson, spoke about her work with the Weekend Power Pack Program, and how the little faces of her students light up when they take home food from the Food Bank. We also heard from Dave Minnich, a “super” volunteer from NetApp, on the importance of volunteerism. And finally, our Chair of the Durham Regional Council, Amy Gamber, cut the ribbon and officially opened the new location of our Durham Branch. See more action from the Ribbon Cutting Ceremony by viewing our Storify or Flickr Album. With our mission always at the heart of everything we do, Food Bank staff and volunteers wasted no time and got right to work. 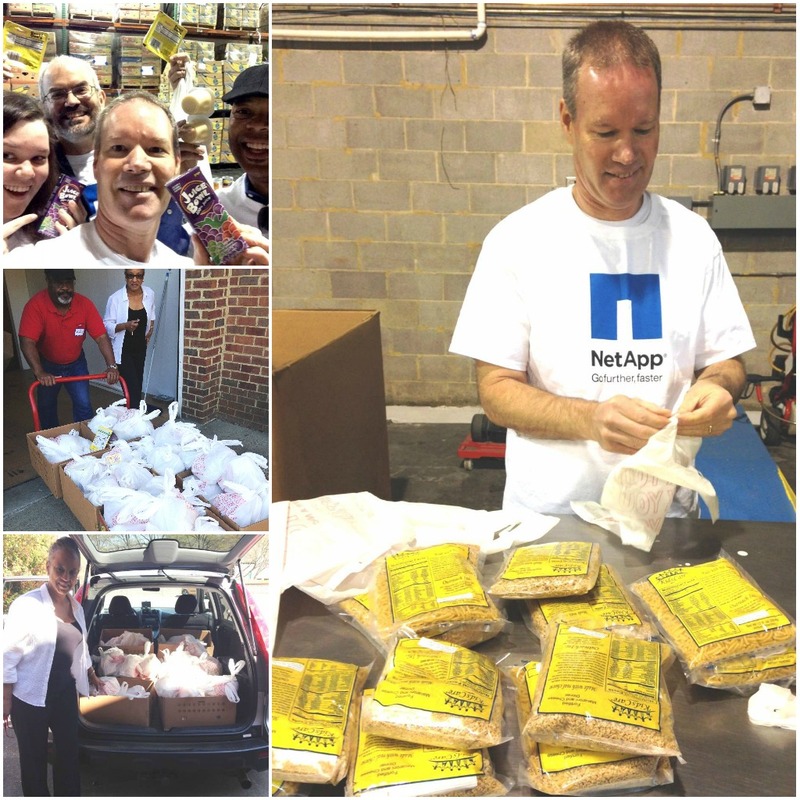 Before the celebration had even begun, NetApp volunteers began putting together packs filled with juice, cereal, and pudding cups for our Weekend Power Pack Program. And before it was over, volunteers had loaded them into cars and sent them on their way to local schools. A volunteer from Burton Elementary School in Durham picked up 50 bags on this day. Burton has worked with the Food Bank for over 6 years and their volunteers distribute 200 packs each month to their students. At the ceremony, they expressed their excitement that the increased capacity of our new branch will allow the Food Bank to provide more packs for the weekend, feeding even more children in need. We’ve watched the need for emergency food assistance continue to rise in the Bull City community, and are so grateful for the opportunity to strengthen our efforts and feed more families. We look forward to the hard work ahead, and thank you for your support! This incredible achievement could not have been possible without our generous donors. Westminster Presbyterian Church for providing the shopping cooler. Food Lion for providing two replenishment coolers. Woodforest Bank for providing funds for an administrative suite. JFK Architecture for providing the artist rendering. TROSA Band for providing background music for the ribbon cutting celebration. Harris Wholesale for providing trucking, equipment and other assistance for the relocation. ← We’ve launched a blog!